While I love to cook and try new recipes, my time in the kitchen is often limited. Especially now, with the weather being nice. We spend so much time outside that I find myself scrambling to get dinner made and on the table. I make it a point to look for new dinner ideas that are quick and easy. Recipes with just a few ingredients and minimal measuring. Using items already on hand is a plus. The crock pot is a bonus! 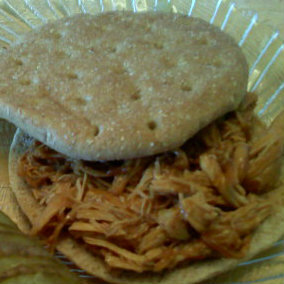 The Prickly Banana's recipe for Zesty Crock Pot BBQ Chicken Sandwiches fit my easy dinner requirements perfectly. I was really excited to add this to our summer menu plan! I was so eager to try this that it was the first meal I prepared this month! I wasn't disappointed! The shredded chicken was so delicious and the recipe so simple! 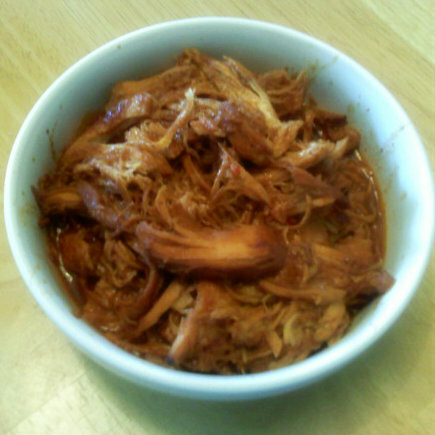 I'll never buy a tub of shredded bbq chicken from the grocery store again! The best part? I was able to start with frozen chicken breast. Since I usually forget to thaw the meat for dinner, the fact that I could use frozen chicken breast is a huge plus. Pour the bbq sauce and dressing over top. Remove chicken from the sauce, shred with 2 forks. Add chicken back to the sauce and stir. Serve over buns, sandwich thins, or use to top a baked potato like I did last night. Most times when I try a new recipe, I alter the recipe slightly depending on what's in the pantry or to fit our tastes. No need for adjustments with this recipe! I had partially used bottles of both the BBQ Sauce and dressing on the fridge door. So happy to get them out of there! This recipe is so simple! There really is no way to screw it up! I only had 1 1/4 cups of BBQ sauce, so I added approximately a 1/4 cup of water to the bottle (to make up the difference of liquid) and shook it up to get the last drops of sauce and poured it into the crock pot. We just happened to have a bottle of the same sauce used in the original recipe. It's not a brand we usually use, but Joe picked it up a month or two ago when it was on sale. Next time, I'd like to try it using my homemade barbecue sauce or even some Butch's Lip Smacking BBQ Sauce. This makes a lot! Joe and I enjoyed this for dinner 3 nights in a row! Perfect to reheat on busy weekends! There's still about half of the recipe left to go into the freezer. Since it makes so much, it would be great to serve for company or take to a pot luck. Thanks so much to the Prickly Banana for such a wonderful recipe! I look forward to checking more of your recipes soon! I love throwing frozen chicken into the crockpot, I do it all the time! This sounds great, I'm going to make something like it for my dad's family party in a couple of weeks! I think I need to bust out my crack pot more often - especially when you can throw frozen meat in it! I always forget to take the meat out of the freezer - but I guess with this dish it's not an issue. Thanks for sharing!